Two Allen & Heath iLive digital mixing systems and a total of 12 new ME-1 personal mixers were used by PA company, APR, to manage monitors for a large gospel event recently held at London’s Royal Festival Hall. Called Sing Inspiration!, the two day festival organised by iGospel, an inspirational music project providing vocal and music tutoring, song writing, audio production and event management training predominantly for children. The 2013 event featured a London-based 500-strong mass choir and various other mass soul and gospel choirs from across the UK, Europe and USA, all backed by the renowned igmusic band, with special guest appearances by Jaz Ellington (star of BBC's The Voice), Israel J Allen, and MOBO award winning gospel star, Rachel Kerr. Taunton based PA rental company, APR Audio, provided the audio system, selecting an iLive-144 system handling general monitor duty at side of stage, such as IEMs and wedge monitors, and 12 ME-1 mixers fed to a second iLive system, giving each musician their own monitor control on stage. 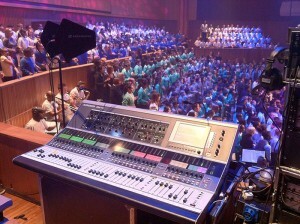 In picture: iLive in monitor position, and several ME mixers on stage.